CUPERTINO, Transylvania, Friday — After bricking unlocked iPhones, kicking applications off the iPhone store that might even slightly compete with iTunes in the far future and filing a wave of patents on basic well-known computer science, Apple Inc. today filed a Form 8-K with the Securities and Exchange Commission declaring that it was openly adopting Evil™ as a corporate policy. I think they are all so full of crap. These big companies just need to have their butts kicked right out the door. Nothing is ever safe with them! 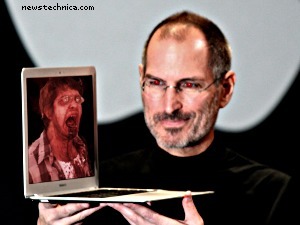 Love the image…I knew there was something creepy going on with that corporation…. “I’m really torn with Apple. As a user, OS X is my preferred to work on, and I like how their systems are over all very solid, but I think that stability has stemmed from their desire to keep a lot of third party software and hardware developers away from their architecture. apparently you havent looked, apple by default, ships every developer tool you would ever need to create software for OS X right on the install dvd. whereas microsoft wants you to spend 1000’s on additional software package. i find a ridiculous amout of open-source for mac’s that i wish i had on pc. Doesn’t Express comes with limitations on redistributing stuff and distributing what you develop?